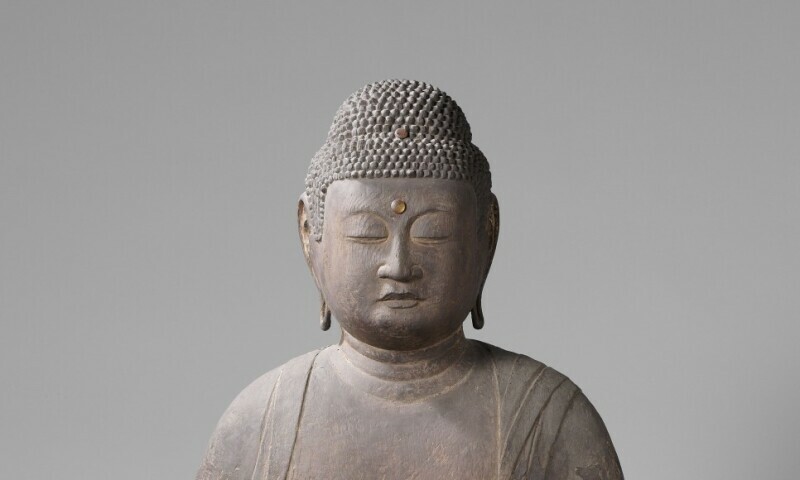 Boeddha Amida, Japan, 1125–75, Rijksmuseum, Amsterdam. A unique thangka, a scroll painting, from the personal collection of His Holiness the Dalai Lama has been made available for the exhibition Buddha’s Life, Path to the Present. Made in Tibet in the nineteenth century, the scroll painting is one of a series illustrating the story of Buddha’s life. The exhibition recounts the life of the Buddha. Born a wealthy prince in the fifth century BC, he chose at the age of 29 to adopt a completely different way of life. The various phases in his life – his birth, renunciation, enlightenment, first sermon and death – symbolize Buddhist belief and form the narrative of this exhibition. The essence of Buddhism is enlightenment, attainable via a consciousness of the here and now. The exhibition makers, including co-curator and designer Siebe Tettero, illustrate the ‘now’ by including works by contemporary artists; some of these are new pieces specially created for this exhibition.